Here you can find information about some of my favorite Microgaming slots, along with some screenshots of my personal wins playing with real money at online casinos. This is just a small sample of the slots found at Microgaming casinos, there are many more great games available when you download the casino software. All the info about these slots is from my personal experience, if I say that a slot seems to pay out or give bonus features more often, that’s just what I have noticed after many spins on these games. Your experience may vary. Microgaming casinos have over 250 different slots and more are added each month. On top of that, there are many other casino games including video poker, roulette, blackjack, and more, totalling over 500 games. 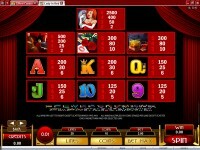 Try many of these slots for fun on the Free Microgaming Slots page. 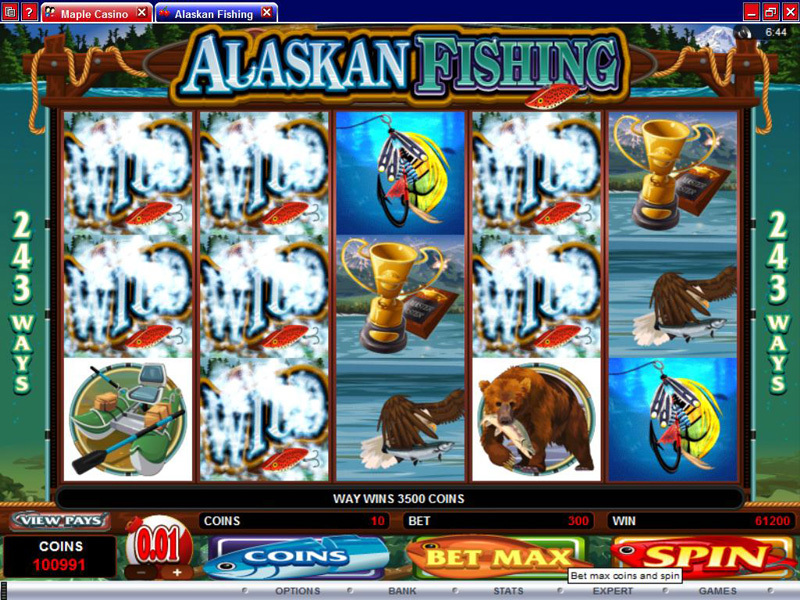 Alaskan Fishing is my favorite MicroGaming video slot, mostly because it has given me the biggest wins, but it can be rough when it’s cold. 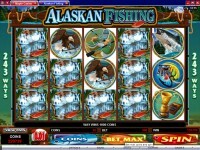 It features 243 win lines, stacked wilds on all reels, 15 free spins with a x3 multiplier, and a Fly Fishing Bonus round. This is the slot I was playing my first night at 32Red Casino when I won $800 on a $3 bet (see my Maple Casino Review to read about my first online casino experience). I didn’t get a screenshot of that win, but if you look below you will see some of my other wins on this slot, including my biggest win I ever hit on a single spin. The Fly Fishing Bonus is triggered by getting a fisherman on reels 1 and 5, you get 5 choices between places to cast your line and catch fish that can win between 2x and 15x your bet. The best I have done on a $3 bet is about $150. Free spins are triggered when three or more scatter symbols land on the reels during a single spin. 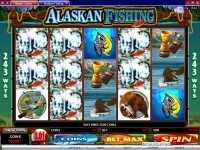 You are awarded 15 free spins with a x3 multiplier. Free spins can be re-triggered and the bonus can be triggered within free spins, the bonus win is not multiplied by x3 multiplier for being in free spins. I have had good luck with this slot, when it’s hot it can pay you very well, but when it’s cold it can eat your money fast. The stacked wilds seem to show up on the reels more often than in other similar style games, and the fishing bonus triggers fairly often. The free spins don’t seem to trigger very often. Play it now at any of these great MicroGaming casinos! 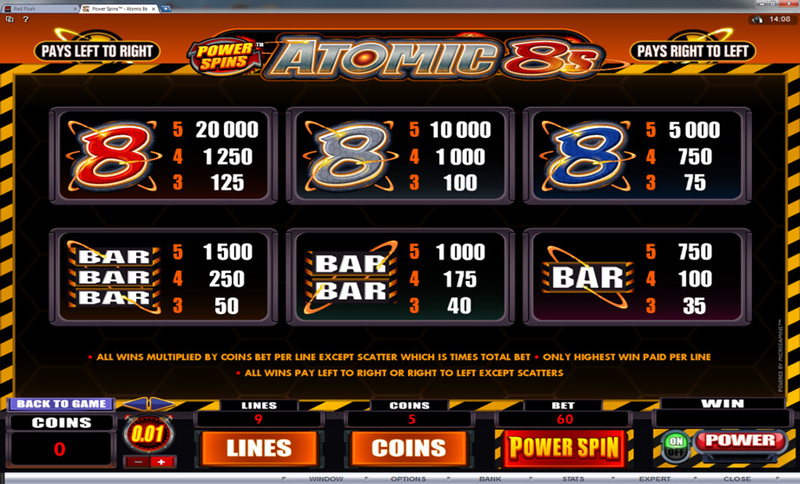 Power Spins – Atomic 8s is a great new release from the leading software company, Microgaming. 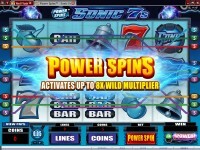 This game features 5 reels, 9 paylines, and the Power Spins feature which enables both left-to-right and right-to-left wins when activated. The game allows players to choose from different coin sizes that range from $0.01 to $1 per payline. Players can bet as many as 10 coins on each line, making the maximum bet worth $90 a spin, or $120 if playing the Power spin feature. This game has attracted the attention of those who enjoy traditional slots, but also like the new video slots from time to time. Players will enjoy the classic symbols of bars, bells, cherries and 8s. The graphics on the game are outstanding and the background sounds are enjoyable. To make the game exciting, players can add to their wager and place a Power Spins bet, which can increase the amount won while playing the game. 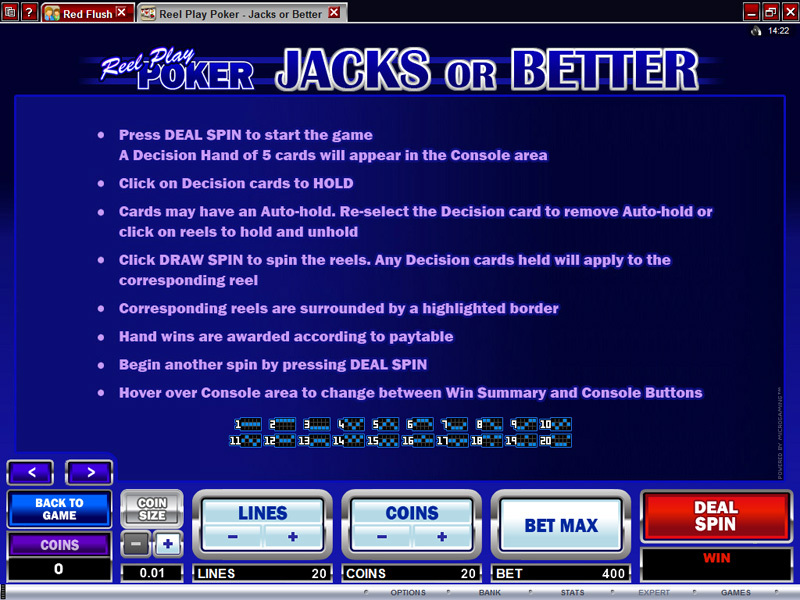 The Power Spins feature will cost 3x the line bet and will allow players to win both left-to-right and right-to-left. Play it now at Roxy Palace Casino! 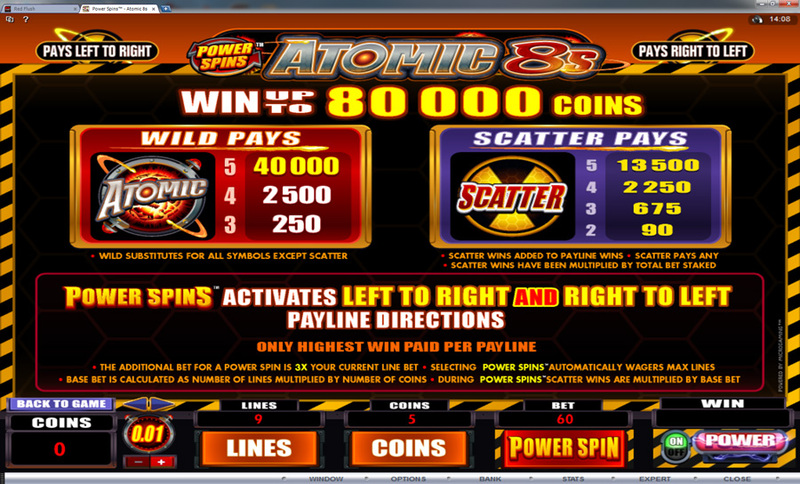 Players can increase their winnings with the wild symbol, which is the Atomic 8s logo. This symbol can appear anywhere on the reels. While this is not a multiplier, it can help players create more winning combinations. If five of these symbols appear on a payline, players will enjoy an 8,000 (times the bet per line) coin payout. The radioactive symbols are the scatter icons and players will need to get two or more to receive a scatter payout. Five scatter symbols will award the player with 300x the amount of their bet. While Power Spins – Atomic 8s does not have all the bells and whistles of modern video slots, it is an entertaining game. 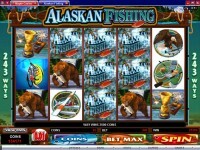 Many players who enjoy spending time on the traditional three reel games will enjoy the simplicity offered by this slot. 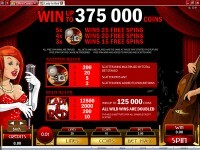 Though there are no bonus rounds or multipliers, players who enable the Power Spins feature will receive more payouts. This game has become a popular choice for many players looking for a new game with a classic style. It also attracts many high rollers because of the high betting limits in place. 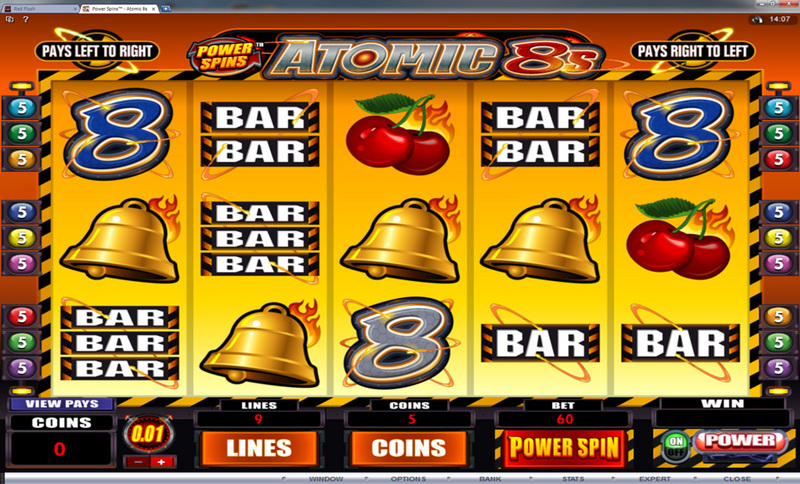 Power Spins – Atomic 8s can be found in many Microgaming online casinos and is a great choice for any player who is new to online gambling. With this game, players will get a feel for video slots without having to be confused with multiple symbols and bonus rounds. With a simple layout, easy to see symbols and paylines that are easy to understand, this game may be simple, but it can produce some amazing cash rewards. 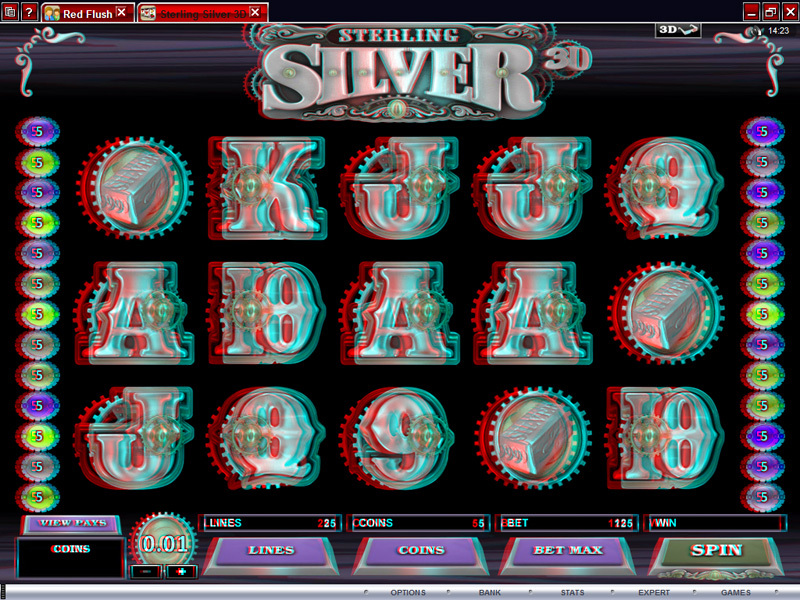 Sterling Silver 3D is a fairly new Microgaming powered online slot machine which has 5-reels and 25-paylines. This is the first true 3D slot machine offered by the software, so you can imagine the popularity of the game since its release. This is just not ordinary 3D game; you actually need those funny looking glasses to fully enjoy the effects of the graphics. The symbols on the screen really come to life and pop out at you while you play, granted you have your awesome specs on. 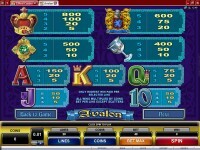 The symbols are classic slot game icons such as high playing card values, Bars, Wilds and Scatters. All of the symbols are 3D, the type that you need the old red and blue glasses for, and there are plenty of cool animations as you spin. The wild symbol is the Sterling Silver symbol and it acts as a substitute for all other icons in the game except the scatter logo, and it’s also a multiplier that can multiply your win up to 10x! When three scatter symbols land during the same spin, you will receive 15 free spins. All wins during the free games are doubled and the wild is active acting as an additional multiplier. The games can be re-triggered as well; making it possible to receive an unlimited amount of spins. The coin denominations start low at $0.01 and peak at $.25 per payline. You can also change the paylines that are enabled, however; it’s always best to keep as many lines in play as possible. The maximum bet per spin is 5 per payline, making it a high maximum bet at $31.50. The maximum payout is $100,000 when playing maximum coin stake, however; no matter your bet size the jackpots are awesome. 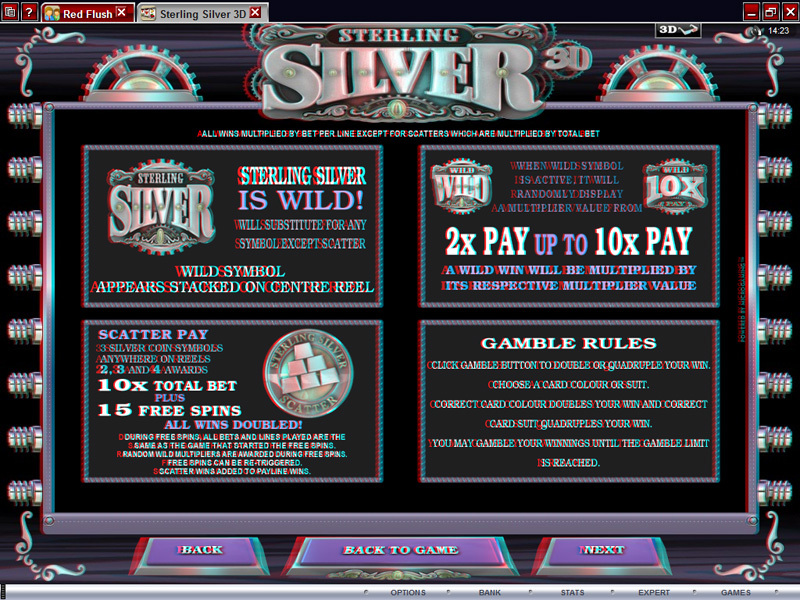 All in all Sterling Silver 3D is a unique slot experience and is well worth playing. If you find yourself at your favourite Microgaming online casino, I recommend giving it a spin or two. Even without the glasses the payout potential is enough to keep players spinning their way into three dimensional wins. 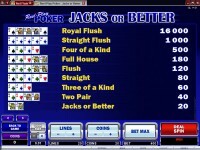 Reel Play Poker: Jacks or Better is an online slot machine released by Microgaming. This is one of the newer releases by the software. The game is pretty simple in comparison to other games offered by the developer, and the idea is basically a multi-hand video poker game in the form of a slot machine. The layout is 5-reels, three symbols/cards high, with 20-paylines. The symbols are all cards from a regular deck. This includes the face cards and all suits. The objective of the game is to make the best hand possible on the payline; and the payouts are paid according to the classic poker paytable. 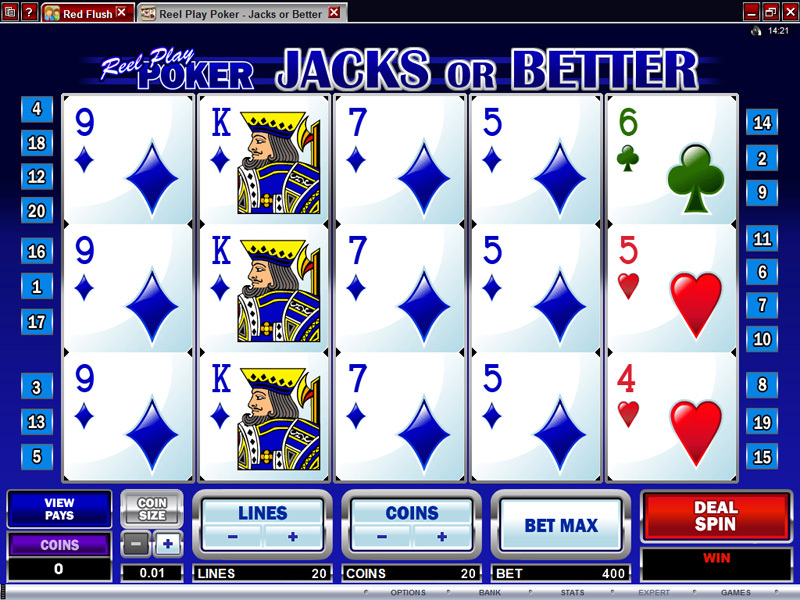 The jackpot in the game is of course the Royal Flush which pays out 8,000 coins. 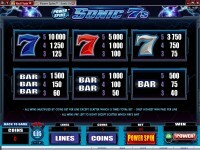 In order to win the jackpot you must get an A, K, Q, J and 10 of the same suit on an enabled payline. It’s really a simple game and if you love poker, this game may become one of your new favourite games to play when gambling online. There are no wilds, scatters or bonus feature and what you see is what you get when it comes to playing Reel Play Poker: Jacks or Better, but for some players simplicity is key. The graphics are simple and the design is basic, which is surprising considering the new releases lately from Microgaming. However, it does have good payout potential which is bound to attract many players, and I think they did a good job of combining video poker with a slot machine. If you want to give this game a try, you can find it at any Microgaming online casino. 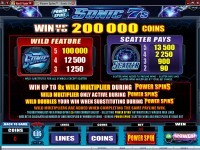 Power Spins: Sonic 7’s is a new game powered by Microgaming software. The game takes on a classic theme with a modern twist using symbols and icons from slot machine past. The layout is simple with 5-reels and 9-paylines. The betting abilities of the game is a bit different from other games offered by the software; and you will find that for an extra 3x the line bet you will have the ability to activate the awesome power spins feature. Activating the Power Spins Feature will add a x2 multiplier to all the wild symbols, which add together when on the same payline making it possible to get 8x your win. The other symbols in the game are of course 7’s, Bells and Bars. The wild symbol is the most impressive symbol when it pays out and there are wins of 200,000 coins achievable with this symbol should five of them appear on an active payline. Scatters are profitable as well with wins between 180 and 27,000 coins possible. With a maximum bet of 60.00 credits a payout of $100,000 is possible. Although this bet is saved for the high rollers, any bet will prove to be profitable should the five wild combination be hit with the power spin feature activated. 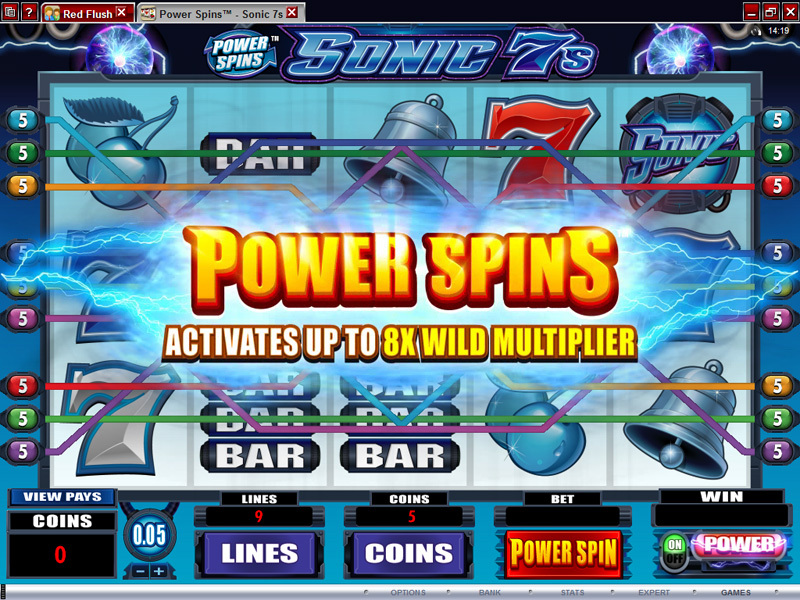 Using the power spins can prove to be even more awesome as all multipliers are added when on the same payline. If two wilds are involved in a win, it will be multiplied x4, and so on up to x8. However, lining up 5 wilds will not multiply the win x10. This feature is potentially quite profitable for a small bet in comparison, so I would highly recommend using it when playing Sonic 7’s. There are a few features available but the most impressive is the Power Spins by far. If you are looking for a new change in pace, try out this new game on your next visit to your favourite Microgaming powered casino. 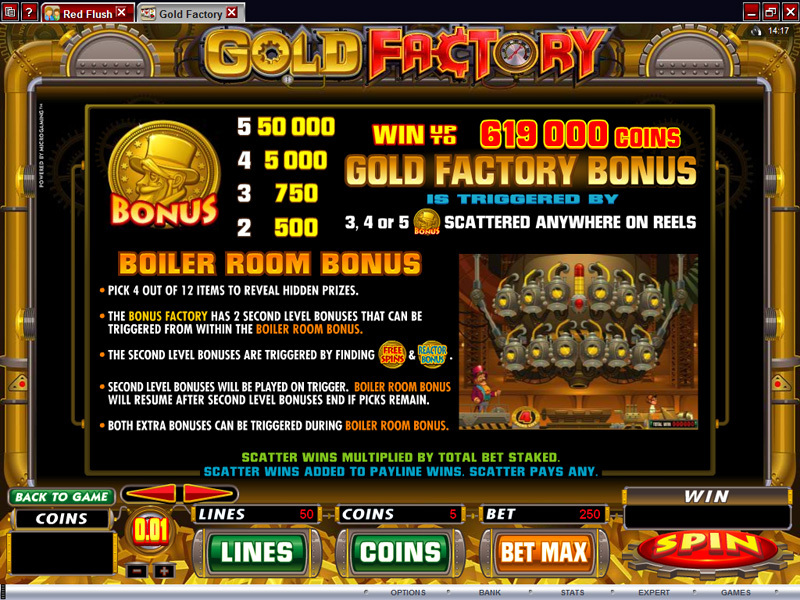 Gold Factory is a 5-reel 50-payline online slot machine powered by Microgaming that was just released in June 2011. It’s based on a Gold Factory that pumps out gold all day and the game is complete with graphics, animations, sounds and features to keep you entertained while hopefully winning a bunch of money. Microgaming is known in the industry for having cutting edge games, and this time is no different. I have had good luck with this slot. The most attractive feature in Gold Factory is the multi-stage bonus feature that is activated when three, four or five Gold Bonus symbols appear in any position on the reels. The feature starts out on level one and there are two levels above it that can be triggered if you are lucky enough to find the special icons. You are given four picks when the bonus starts, so that is four chances to win big and advance. The picks will either award entry to the next level or bonus cash prizes; depending on your luck. The special icons can take you to the Reactor Bonus or the Free Spins feature. If you are lucky enough to trigger the Reactor Bonus, you will pick random symbols that reveal prize amounts, and you can continue to pick until the Reactor shuts down, thus taking you back to the main bonus feature where you will continue on with your four picks if you didn’t finish before. If you find the free spin icon in the main feature, you will be taken to the Free Spins Bonus and you will spin to reveal the number of free games you will receive. The number of free games you can win during this feature is between 10 and 35, and the free games could bring huge wins of over 600,000 coins with maximum bet. The normal game mode is also exciting and has jackpot potential of 100,000 coins. 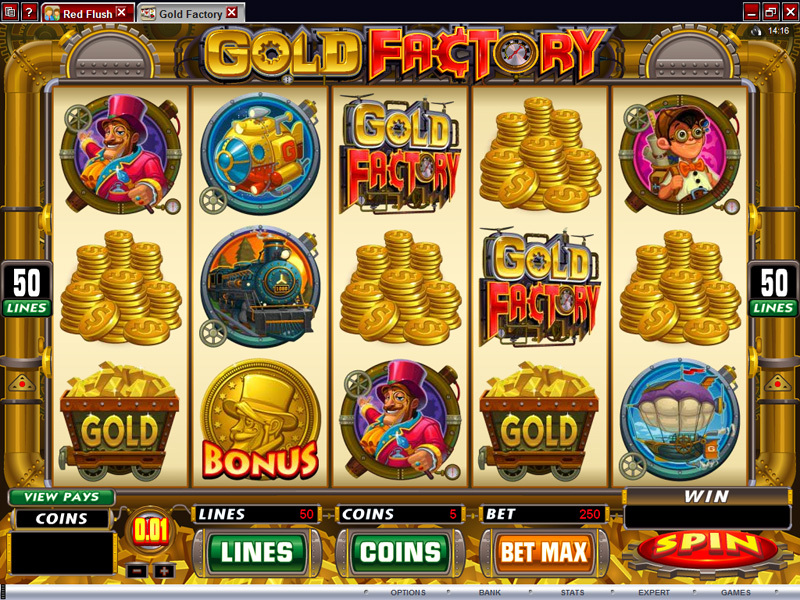 If you would like to play Gold Factory, try your luck at any of these Microgaming casinos. 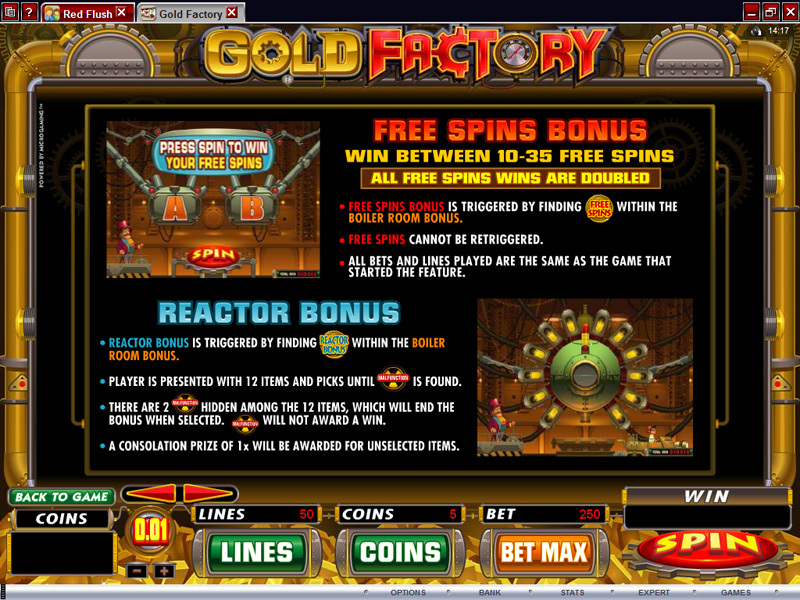 You can also Click Here to get 50 free spins on Gold Factory at Red Flush Casino. 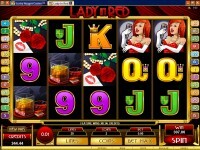 Lady in Red is an online video slot powered by Microgaming. 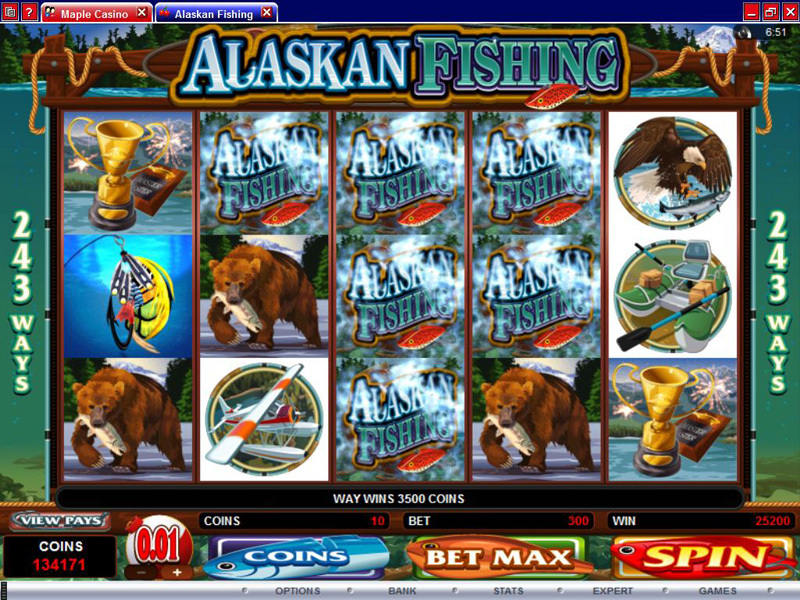 One of the most recent releases by the casino platform, the layout is simple at 5-reels and 25-paylines. The theme is music inspired, based on a cabaret singer and the story is played out on the reels in true Microgaming form, and the entire design is much like other games offered by the software. The symbols are inspired by the theme and include standard playing card values, cocktails and there are scatters, wilds and jackpot symbols just as you would find in almost any slot game in the video slot menu. The wild is the Lady in Red logo, and it substitutes for all symbols on the reels besides the Camera scatter. 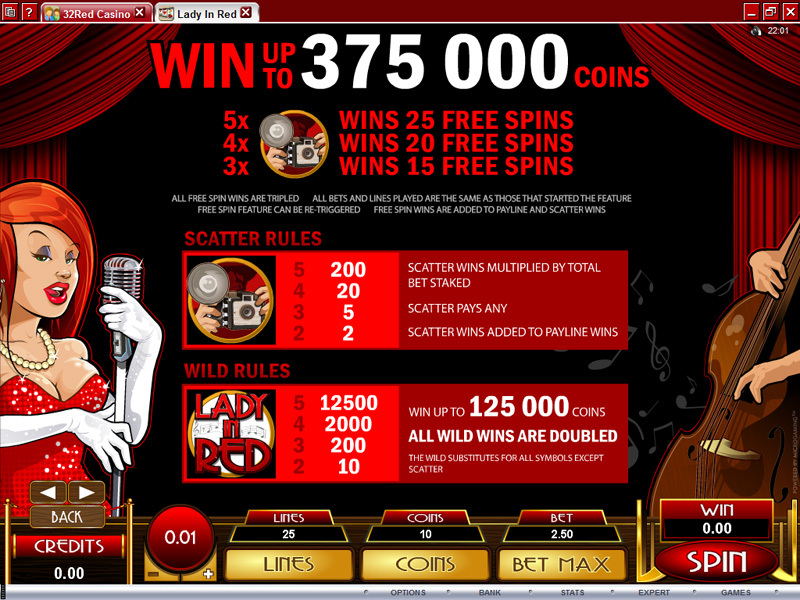 The wild appears on all reels, making a payline win of five wilds possible which is the largest payout in the game. The fixed jackpot is worth 12,500 coins, which is pretty impressive for any bet size and the second largest payout is also impressive at 2,500 coins; all wins are multiplied by line bet. There is a free spin bonus, and the scatter symbol activates it when three or more symbols appear on the reels in any position. You can win 15, 20, or 25 free games when 3, 4, or 5 scattered Camera symbols trigger the feature and all wins are multiplied by 3. 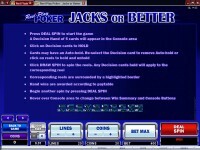 The free spins feature can be retriggered, making it possible for indefinite free games. 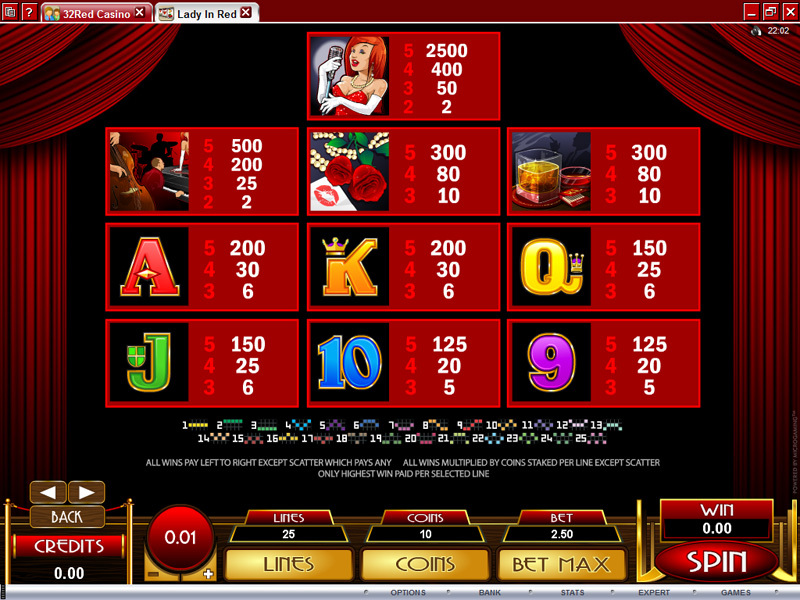 Overall, Lady in Red is similar to other games found on Microgaming casinos. It does have payout potential which will attract many players, but the wow factor isn’t there. It lacks a second screen feature, the audio is mediocre; but there are still 12,500 reasons to check it out on your next visit any Microgaming powered online casino. 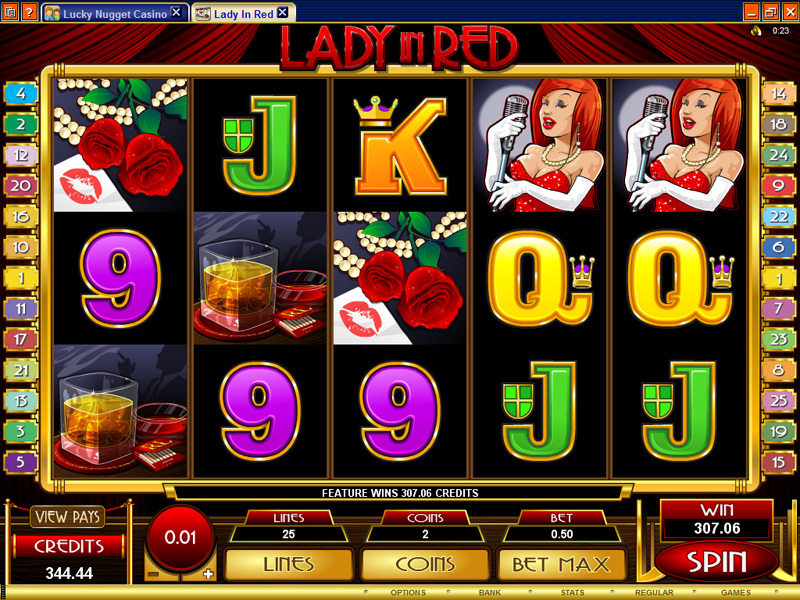 If you need help finding a casino to play Lady in Red at, check out these Microgaming casinos. 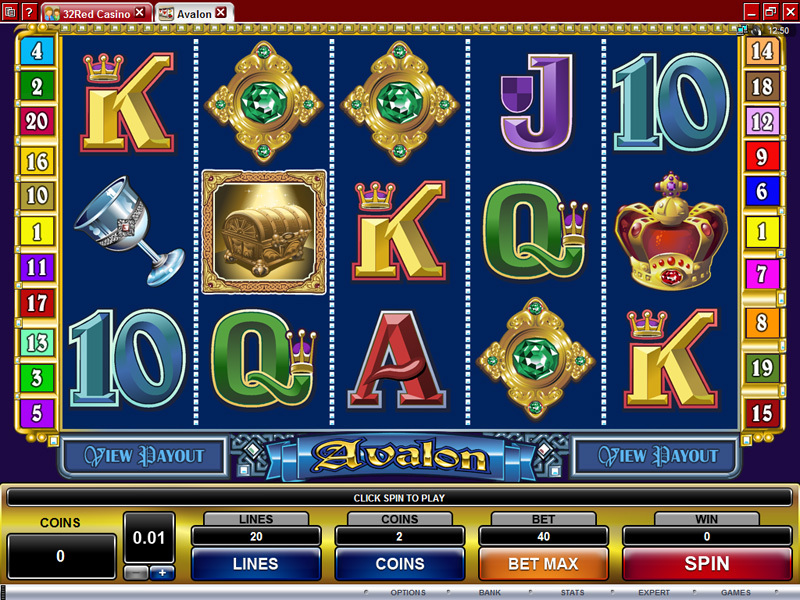 Avalon is a 5-reel 20-payline slot machine powered by Microgaming software. 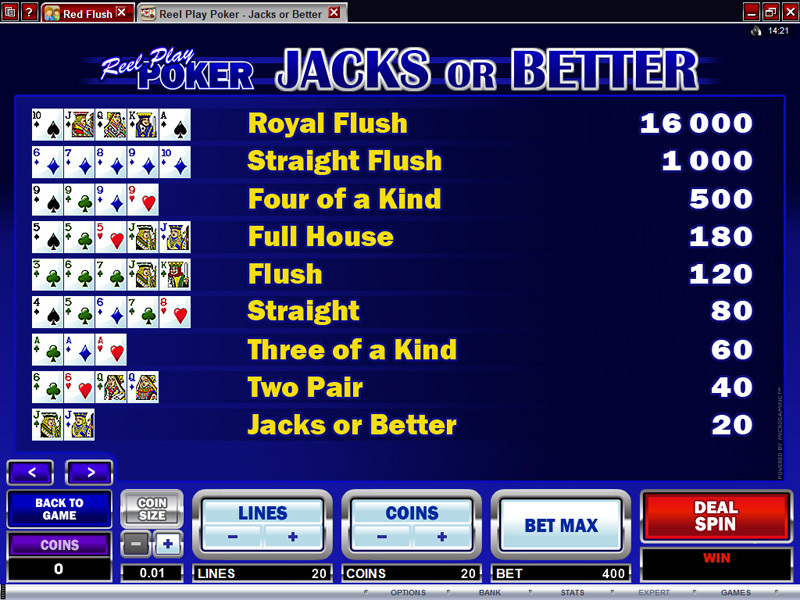 The layout is simple, and the graphics are very basic, however; the payouts more than make up for it. The bonus feature alone could bring over 200,000 coins in a single spin which could make any slot player excited about pressing the spin button. This is one of the most popular games at all Microgaming powered online casinos and can be found on both the download and instant play casino client. You can also play a free demo here. The theme of Avalon is based on the legend of King Arthur. Avalon is a mysterious place and the Lady of the Lake can be seen in the mist. The Avalon Mist is the wild and will substitute for all other symbols in the game besides the scatter. The more wild symbols that appear on the reels, the better, as five wilds will payout the fixed jackpot in the game of 3,000 coins when on an active payline. 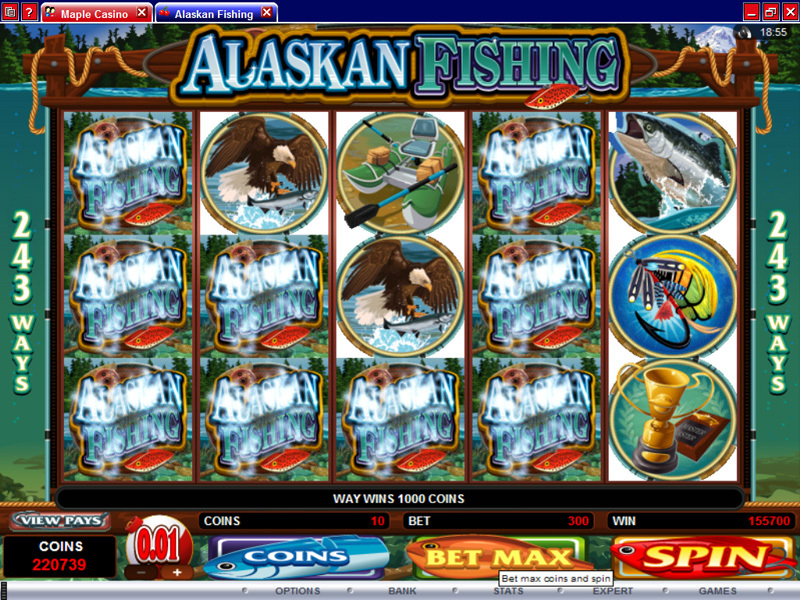 The Lady of the Lake symbol in Avalon is the scatter and can not only multiply your total bet depending on the number of scatters that land on the reels, it will also activate the free game feature. When three or more scatters appear in any position on the reels the free game feature is activated and there is an extra wild. The Treasure Chest symbol, which is a normal symbol during the regular game mode becomes wild during the feature; making the possibility of five wilds even greater during the free games. Not only is there an extra wild, there is a random multiplier. 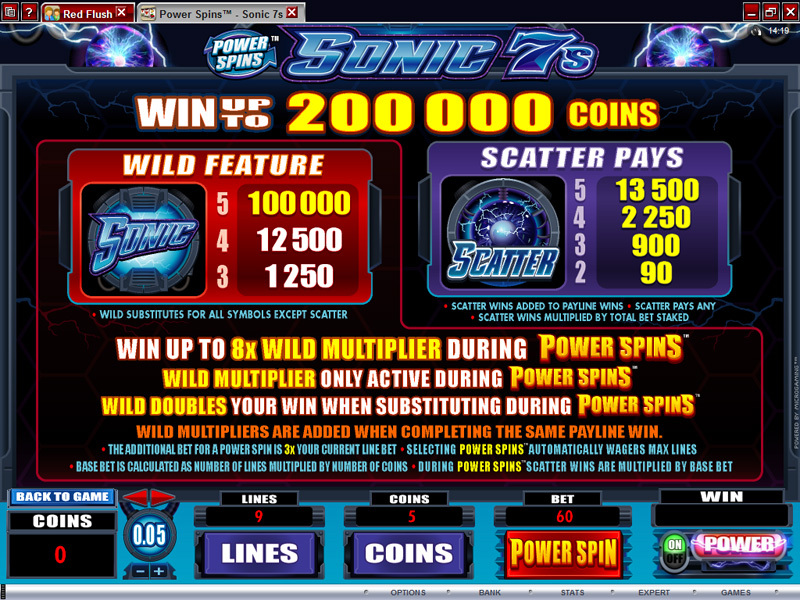 Every win will be multiplied during all 12 spins all the way up to 7x. This is where it gets really exciting because the payouts can be massive and even with the minimum bet size, the wins could increase your bankroll substantially. Avalon is a coin based game and the denominations range in between $0.01 and $0.50; furthermore the paylines may be reduced to your personal preference. It is recommended that all lines stay active to ensure the maximum winning possibilities. The maximum bet no matter the coin value is 200 coins, which is perfect for all types of players. The more risky slot spinner to the modest conservative player, everyone will find a bet that works for them. 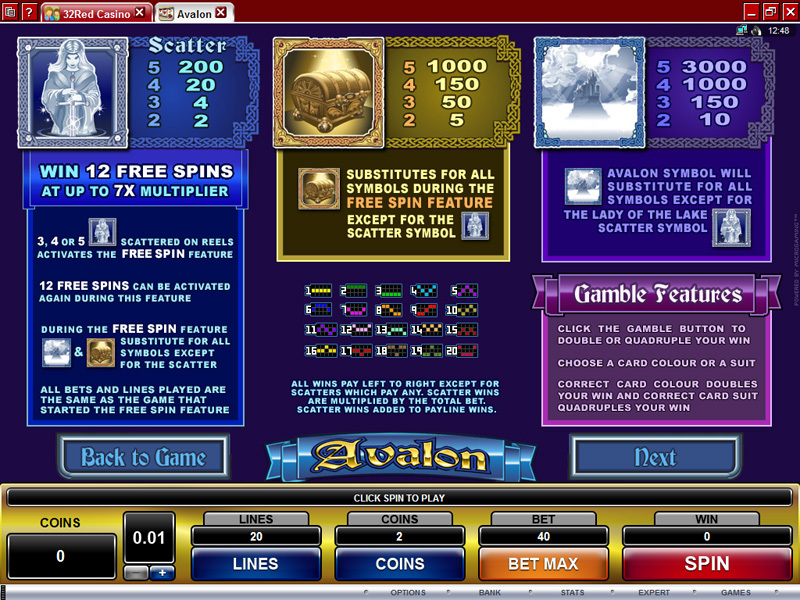 Finally, there is a gamble feature in Avalon. This option gives you the opportunity to double their wins made on the reels. If you decide to gamble you will be taken to a second screen where you must choose the colour of the facedown playing card. It’s quite simple, and if successful, very profitable. You should also keep in mind that if you gamble and lose; all wins will be lost and you will be returned to normal game mode. 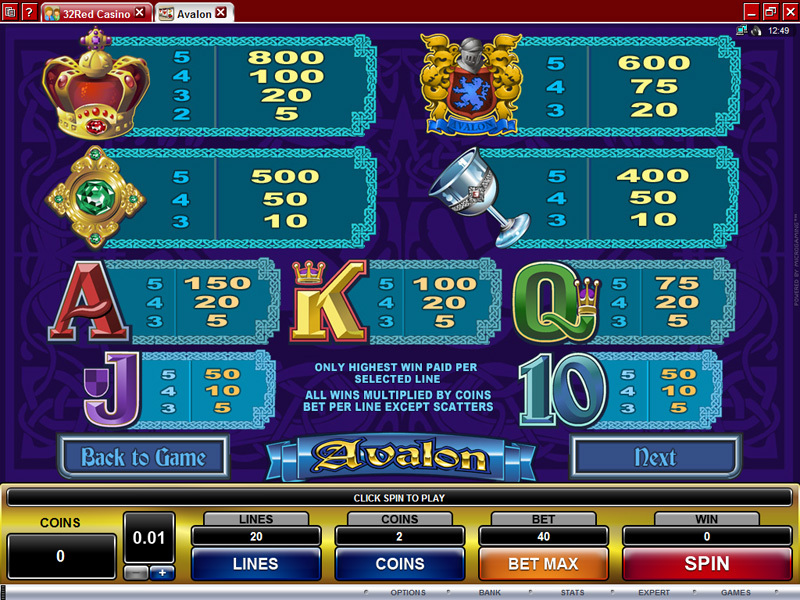 You can find Avalon, along with many other games at your favourite Microgaming powered online casino. 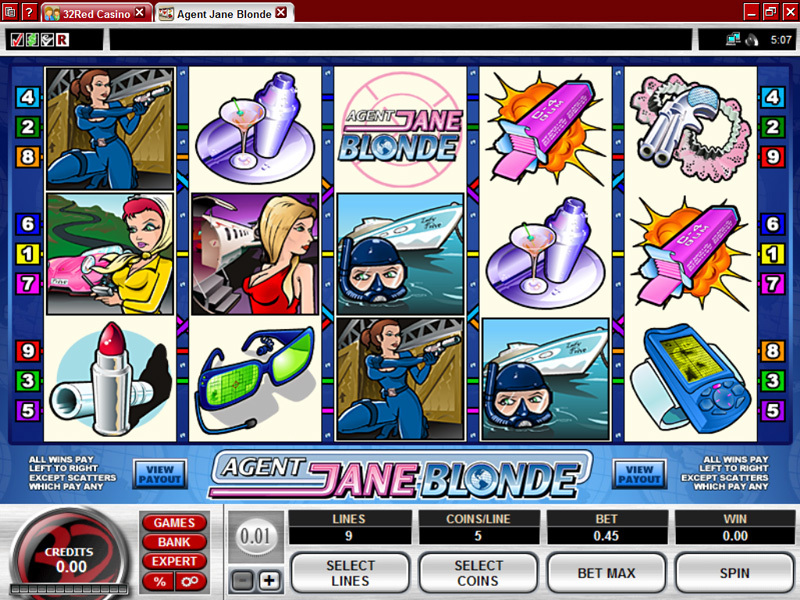 Agent Jane Blonde is an online slot machine powered by Microgaming software. One of the older games in the library, you can find this game in the video slot section of any Microgaming powered online casino. The layout is simple, however; the payouts are anything but. 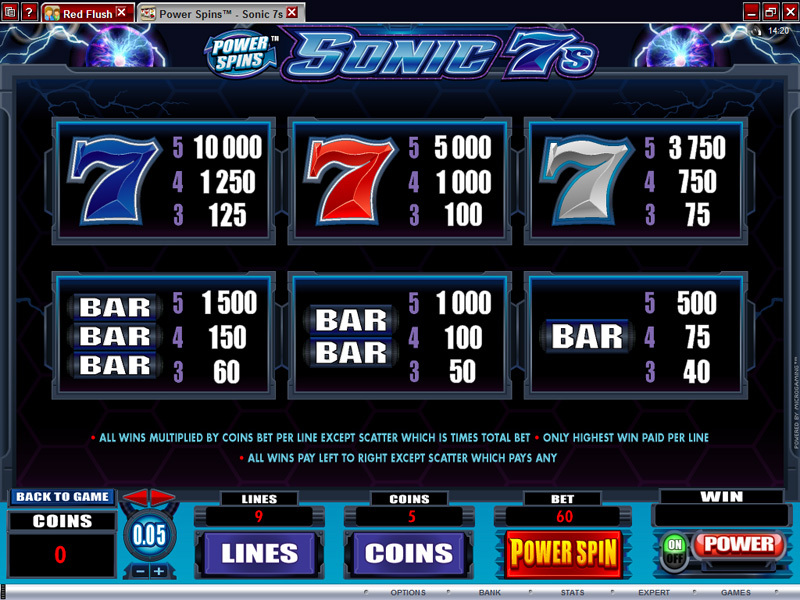 The 5-reels and 9-paylines are filled with large possible symbol combinations, which could make any spin a winning spin. 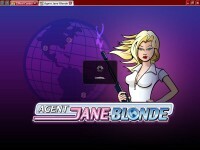 Agent Jane Blonde is a super spy with super looks. Don’t let her pretty face fool you, she is capable of taking even the biggest threats down to their knees and getting all the information she desires. The symbols on the reels are thematic and include both female must-haves like lipstick, cell phone and sunglasses, and Jane in many different disguises. The wild symbol and the scatter are helpful in creating more wins more often, which makes it able to play longer if you are a bit lucky on the reels. 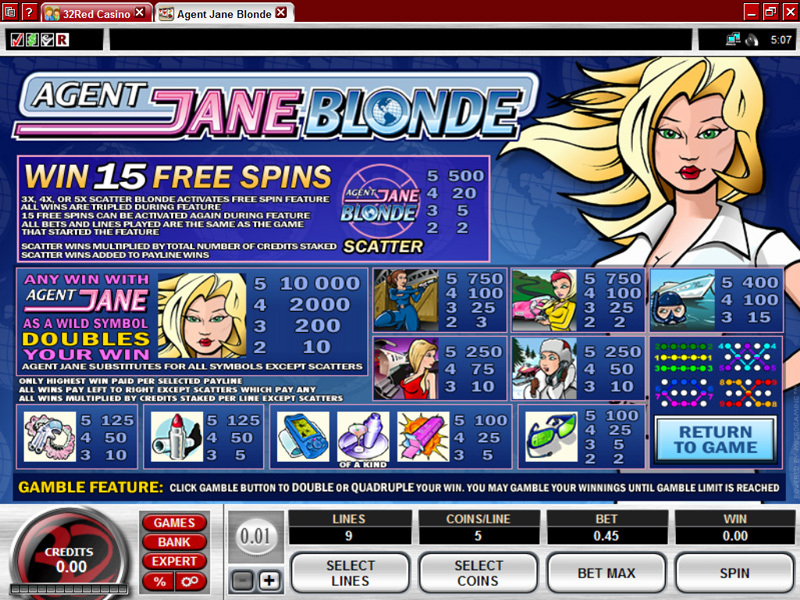 Agent Jane Blonde is a coin based game and you can choose between $0.01 and $1 per payline and up to 5 coins per line as well. This is great if you like to play high variance games for high stakes as all the payouts are profitable even on minimum bets. Also, average or low rollers will appreciate the low bets that are possible. The paylines may be reduced, but it’s not recommended. The wild in the game is Jane Blonde of course and she will substitute for all other symbols on the reels besides the Agent Jane Blonde scatter. The wild symbol is also the highest paying symbol in the game and it will pay you 10,000 coins for five of the Jane Blonde symbol on an active payline. The wild will also double all wins it helps create. The scattered Agent Jane Blonde logo serves two purposes, it will award scatter wins for two or more symbols in any position and will also trigger the free game bonus feature. When three or more scattered logos appear on the reels; not only will the scatter win be paid, but the 15 free games with a x3 multiplier will be triggered. The free games may be retriggered during the free spin feature, and the bonus could go on indefinitely, although that is not likely. There isn’t a second screen bonus feature and the free games can be quite profitable as the wild is active during the feature. Just remember that the more wilds you see at any point in the game, the better. You can also double your wins at any time with the gamble feature. This option is optional and you can double or quadruple your wins. Be careful, if you chose to gamble and you are unsuccessful, all wins will be lost. Check out the screenshots below for paytable information. If you are ready to try your luck with the beautiful Agent Jane Blonde, look for her at any of the trusted Microgaming casinos listed here.